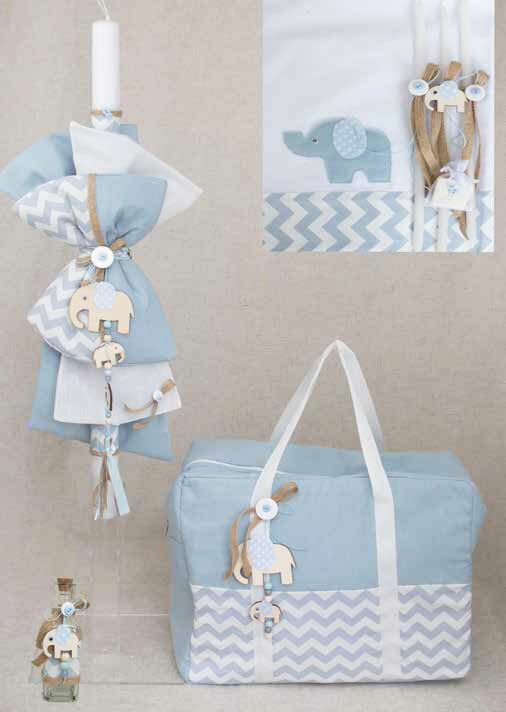 Gentle and cute baptismal set with elephant theme for your little boy. The whole set has soft contrasts of white and light blue. Beautiful fabrics are wrapped in the candle in such a way that they form a big bow and there with a thick ribbon of coffee hanging wooden cute elephant. The same elephants decorate the towel and the oil bottle, and the three candles. The set is accompanied by a large suitcase bag also in gorgeous soft colors. The set includes: a candle, a large suitcase, three candles, a soap, a bottle of oil, laurels, underwear and towels. https://www.preciousandpretty.com/2018/07/baby-elephant-baptism-set-for-boy-E814.html Greek Wedding Favors|Orthodox Crowns|Stefana|Baptism Invitations Baby elephant baptism set for boy E814 Baptismal set for boys, with an elephant theme, in soft baby blue color. Product #: Greek Wedding Favors|Orthodox Crowns|Stefana|Baptism Invitations_8413420192867963599 5 stars out of 5 reviews.